DiMartino Booth - Is the Fed’s Balance Sheet Headed for the Crapper? For the last two weeks, gold and silver have hit resistance as they've moved up in trading. Silver’s resistance levels are at $18.30 and $18.50, while gold’s are at the $1250 and $1270. Last week, they both were able to breach their first levels of resistance, but they were not able to break above the latter two resistance levels. The precious metals charts below are showing that this week will most likely be a week of consolidation and profit taking. However, fundamentally we still have the French Elections coming up on April 23rd which should continue to support the prices of silver and gold. Also, Janet Yellen, the Federal Reserve Chairman made a surprise announcement that on the 10th of April she will be making a speech and taking questions. This may have something to do with the Resignation of Jeffrey Lacker or it may not, either way, whatever she says about the future of interest rate hikes, could be either positive or negative for the precious metals. Furthermore, fundamentals trump (no pun intended) technical analysis so depending on what Yellen states in her speech, it could change the direction of the market in an instant. 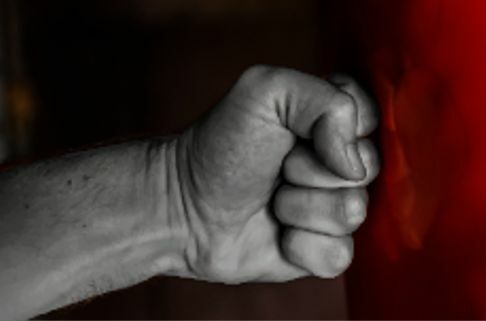 But, barring anything out of the ordinary, this week's charts are showing us that a new negative pattern will reverse the prices of the precious metals in the short-term future, while their long-term direction is still positive. Three weeks ago, I posted the chart below for silver, in it, you could see the Old Falling Expanding Wedge and a New Falling Expanding Wedge (bullish patterns) in the chart. Over the last two weeks, the New Falling Expanding Wedge pattern has been playing itself out as expected. 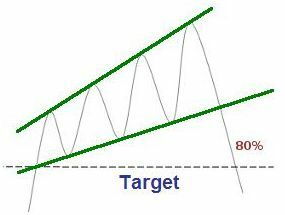 Now that silver has finished playing out the Falling Expanding Wedge pattern, a new Rising Expanding Wedge (bear pattern) has formed. 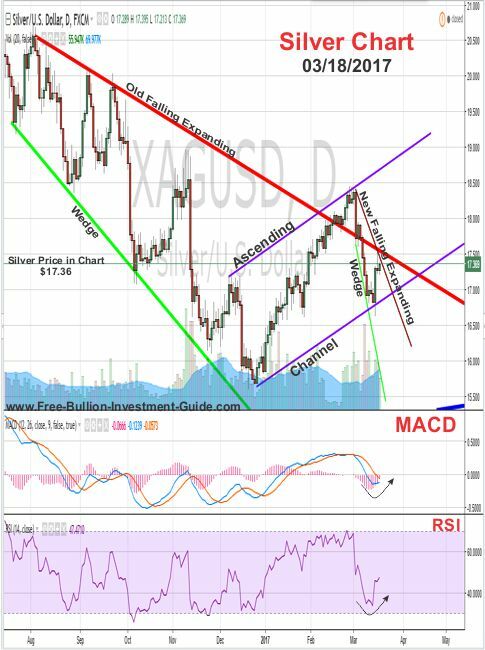 In addition, the MACD and RSI, lower indicators, are showing that silver is hitting resistance. But, even though a pullback is expected, silver is also expected to continue to trade inside its ascending channel. 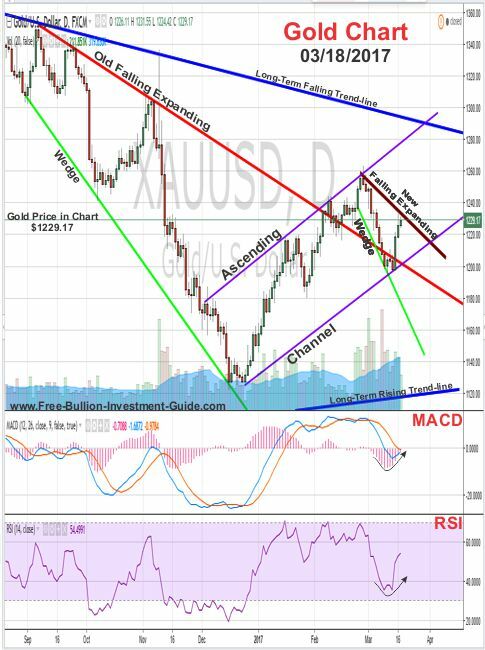 Gold’s chart patterns may look familiar…. Three weeks ago, I posted the following chart for gold, and like silver's chart, it too showed an Old Falling Expanding Wedge and a New Falling Expanding Wedge (bull patterns). 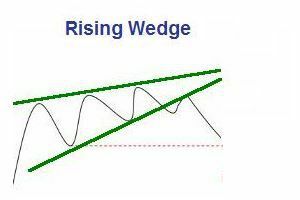 Over the last two weeks, the New Falling Expanding Wedge pattern has been playing itself out, and now that the pattern has been fulfilled, a New Rising Expanding Wedge (bear pattern) has formed in gold's chart. But, gold's bottom indicators aren't showing the reversal in the trading pattern like silver's indicators are, which may be an indication that gold is taking back the lead in their short-term trading patterns. Gold and silver’s trading pattern have been discussed in these blog posts: Gold leads Silver, Gold still leads Silver, and The Freak is Back on the Leash. However, the New Expanding Falling Wedge is looming over Gold's price, so like silver more consolidation in price is expected. 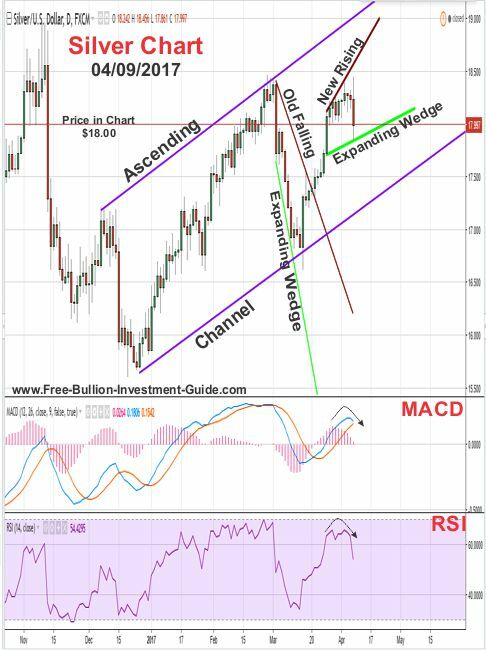 In conclusion, for gold, although a consolidation or pullback is expected, gold, like silver it is expected to continue to trade inside the rising ascending channel. 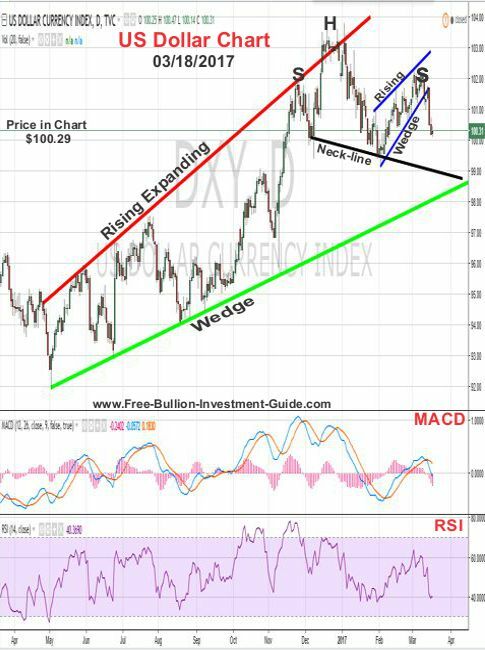 'The other negative pattern that is showing up in the US Dollar chart is a Head and Shoulders pattern. Unfortunately, time has shown "it isn't happening." The US Dollar did not move below the 'neck-line', it briefly touched it then reversed its price direction. 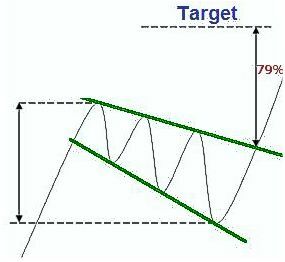 But, the dollar is still trading inside the Rising Falling Wedge (bear pattern) and is still trading in a negative direction with lower lows and lower highs. As long as Janet Yellen doesn't announce anything new tomorrow in relationship to interest rates, the dollar should see resistance at the $101.40 level. Tomorrow, Janet Yellen will give a speech, if the speech is more about policy than Jeffrey Lacker (which I doubt), then we may see silver, gold and the US Dollar make some strong moves. 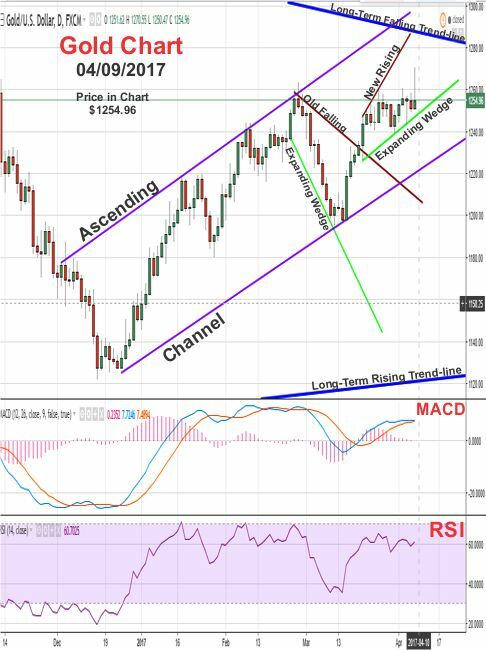 The last two weeks, platinum has moved up its ascending channel, it has tested the bottom trend-line of the channel twice and continues to trade above it. 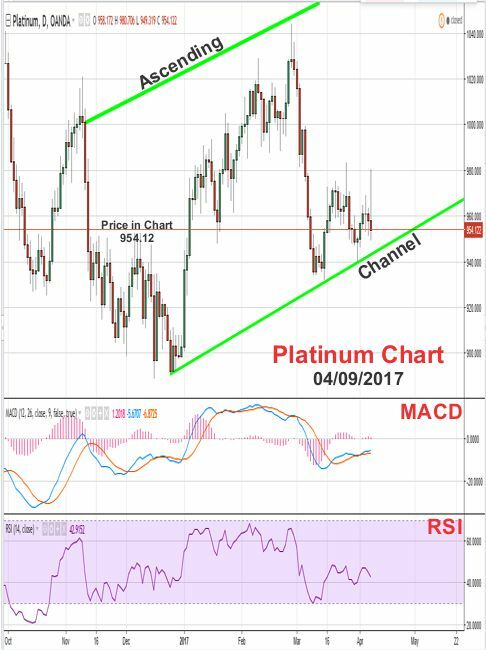 This week, platinum’s chart isn’t giving much of an indication as to which direction it will move, but it looks like it may test the bottom of the ascending channel once again. 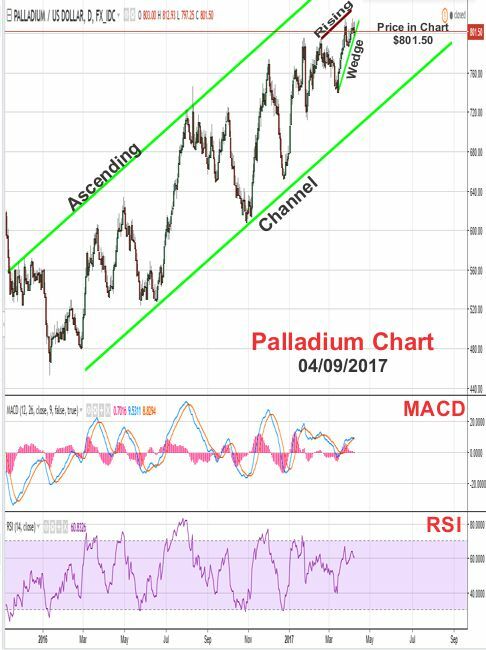 Since the beginning of 2016, Palladium’s price has been trading inside an ascending channel. 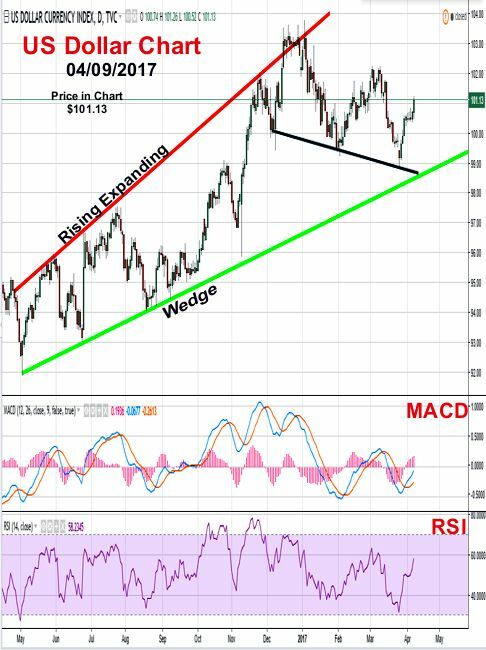 This week, palladium price has formed a rising wedge (bear pattern) and either this week or next it will hit resistance between its current price of 801.50 and $835 and reverse in price.